Different types of insulation can be helpful depending on the project. 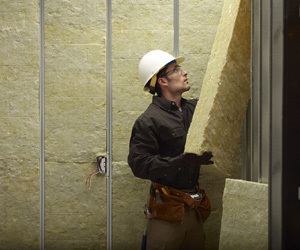 Mineral wool is a great option to insulate commercial and industrial projects. What is mineral wool? Mineral wool insulation is also known as rock wool insulation or slag wool insulation. It is manufactured in batt and loose-fill forms, and can be used to insulate any area of a building. In addition to insulating commercial and industrial projects, mineral wool can be used to insulate residential homes. Mineral wool is manufactured from basalt, a volcanic rock, and is naturally fire retardant. This can be of particular interest in commercial and industrial construction projects. Mineral wool has high thermal performance. It can withstand temperatures of over 700 degrees, making it ideal for commercial or industrial insulation applications that are exposed to extreme heat. Mineral wool is naturally very moisture resistant. It retains its insulating qualities even when wet, making it a great option to insulate a space that faces moisture issues. If you think mineral wool insulation is right for your next project, contact our office for your free insulation estimate. Author adminPosted on October 19, 2017 October 11, 2018 Categories commercial insulation, industrial insulation, insulation, mineral woolLeave a comment on What is Mineral Wool?